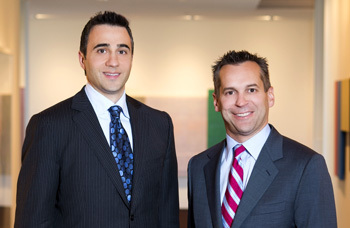 Torys congratulates John Emanoilidis and Kevin Fougere for their recognition as Lexpert's Rising Stars: Leading Lawyers Under 40. John Emanoilidis is co-head of Torys' M&A Practice. His practice focuses on corporate/commercial and securities law, with an emphasis on mergers and acquisitions, and corporate finance. John represents domestic and foreign acquirors, targets, special committees, selling shareholders and investment banks in all aspects of M&A (both public and private), including hostile takeover bids, strategic review processes, proxy contests, going-private transactions, private equity transactions and negotiated acquisitions. View John's profile video here. Kevin Fougere’s practice focuses on financial services law. He has extensive experience advising corporate clients and financial institutions on a wide range of financing transactions, including project financing, syndicated bank transactions, bond financings, cross-border financings, acquisition financings and asset-based lending, as well as advising on general corporate and commercial matters. View Kevin's profile video here. Torys also congratulates Marie-Josée Simard, legal counsel Abbott Laboratories, Ltd., who was also named one of Lexpert’s Rising Stars.